Always Maintain Safe Tire Pressure! CP-2017: Measures 4" x 2" x 6" for carrying on your bike. 12V compressor unit with 66" power cord. 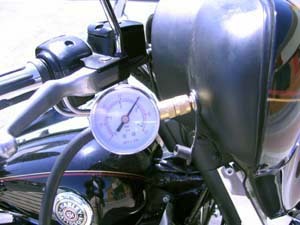 Built-in gauge to 120 psi. LED light to indicated power to unit and locate tire valve in the dark. Includes 36" lighter adapter, 12"alligator clips, sports needle adapter, carrying case and complete instructions. 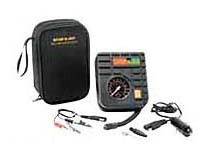 CP-1992: 12V power supply, 10 amp max current consumption, 140 watt power. 28mm cylinder diameter. 7 bar (101 psi) max pressure. 6-1/2 gallon per minute performance. Built-in 6 LED flashlight. Storage bag included. 33" hose and 9-1/2" power cord. You will never be left stranded with a flat tire in any location ever again. 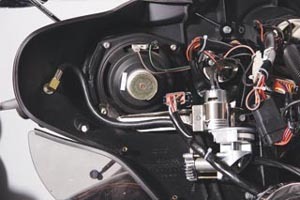 The AC-1E or R is a fairing mounted air pump which discretely installs just under your front fairing. 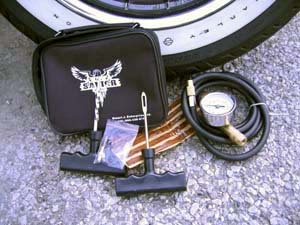 The AC-1K attaches to the Road King frame. In the case of a flat tire, a quick patch job and re-inflation of the tire using the AC-1 and you will be on your way again in no time. 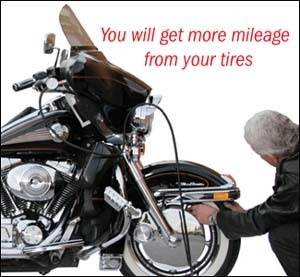 Also use the AC-1 to maintain safe tire pressure at all times. 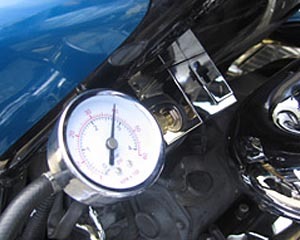 Also can be used to adjust shock air pressure easily on the road or in your own garage. Field tested for four years. 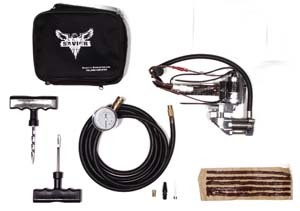 Kit includes tire repair kit and gauge. Easy installation. With the On-Board Air Compressor you will be able to keep your tires inflated at the proper pressure. 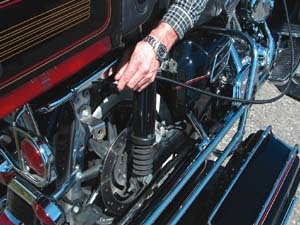 You can also use the product to keep your air shocks at the proper pressure as well. When you connect the air hose provided, it will not bleed the tire and will provide you the current pressure of your tires or shocks. 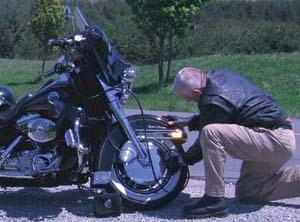 In the case of a flat tire, a quick patch job and reinflation of the tire using the AC-1 and you will be on your way again. This revolutionary design uses custom made brackets and components to ensure a truly custom fit. 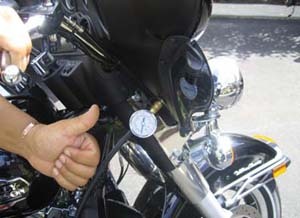 Inflate Tire Pressure with AC-1...ANYWHERE!